Finding a trading service that works well for you is not always as simple as it may seem. Sure, plenty of gurus claim that they can help you make thousands of dollars in a short period of time, but we all know that's not very realistic. You may have to waste hundreds of dollars on different subscriptions before finding a trading community that helps you achieve your goals. Trading is an art, and mastering the craft can take some time. It's all about taking a holistic approach to your education, planning, and execution. At Investors Underground, it's our goal to help develop self-sufficient traders who will one day be able to conquer the markets on their own. We provide all of the tools necessary to make this happen. Making the most of these tools requires that you use them properly. You wouldn't try flying a plane before you took lessons, so why would you attempt to trade before you've educated yourself? There is so much to learn about the markets before you begin trying to trade. The good news is that you can learn from the mistakes of other traders. At Investors Underground, we've developed trading education DVD's that are designed to shorten the learning curve for new traders. These DVD's go over everything you need to know about the markets, including technical analysis, money management skills, level 2 analysis, creating watch lists, and so much more. 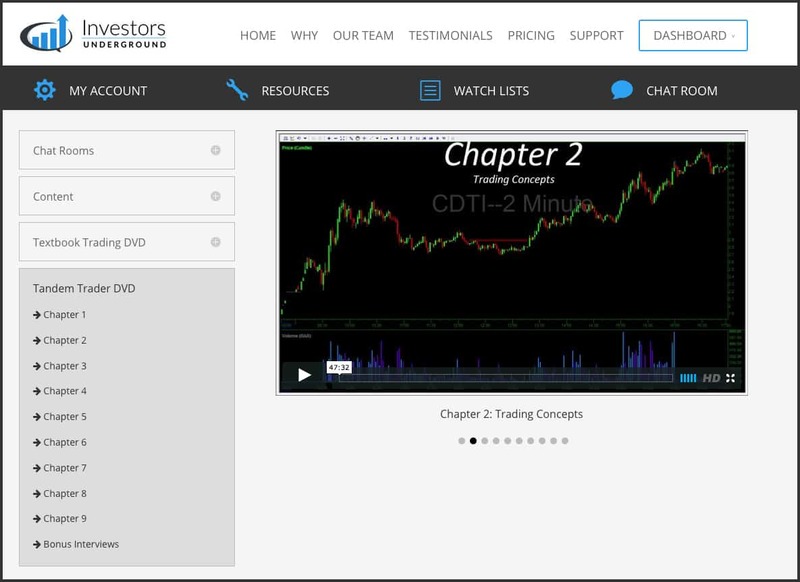 Both Textbook Trading and Tandem Trader are packed with over 10 hours of video content. This content teaches valuable trading lessons for traders of all different skill levels and provides the foundation necessary to confidently master the markets. Sure, it may seem like paying for an educational DVD can be costly, but there is nothing more costly than entering the markets unprepared. Investing in your education can save you from losing lots of money in the markets and help you start profiting. We highly recommend that all new traders invest in our DVDs before signing up for the chat room and scans. Once you have started your trading education, the next step is creating a game plan. Which stocks are you going to trade? What kinds of moves are you looking for? Where are you going to focus your time? We answer all of these questions in our daily stock scans. Every night, we send out a scan of stocks to watch for the next day. This watch list includes charts, how we plan to trade the stock, and the rationale behind the trade plan. The next day, we filter the scan even further after paying attention to pre-market trading activity. Focusing on these scans allows you to come to the market prepared so you can take a proactive approach to trading. Instead of simply reacting to the market and seeing what stocks are moving on our scanners, we come to the market with a trading plan. This allows us to stay focused and only trade the highest probability opportunities. It also takes a lot of the guess work out of trading. 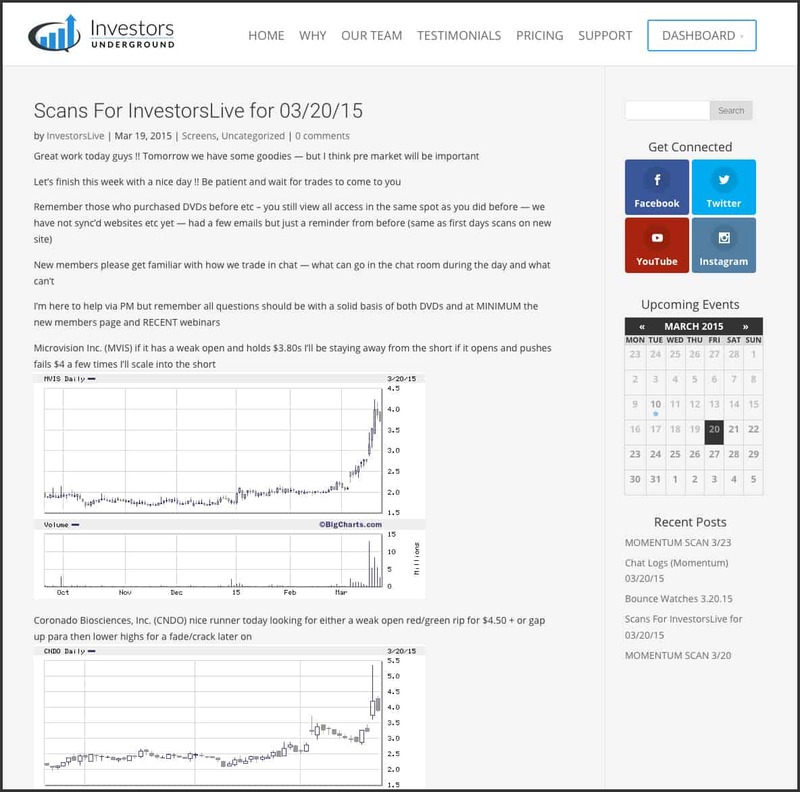 Once you have reviewed scans, it's time to join the Investors Underground community in the chat room. 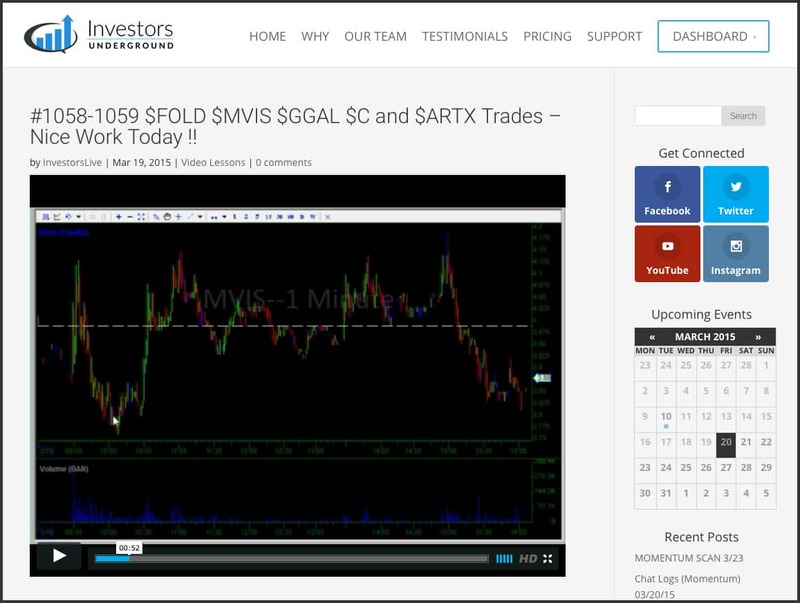 Every day, hundreds of great traders congregate in our chat room and start sharing ideas. 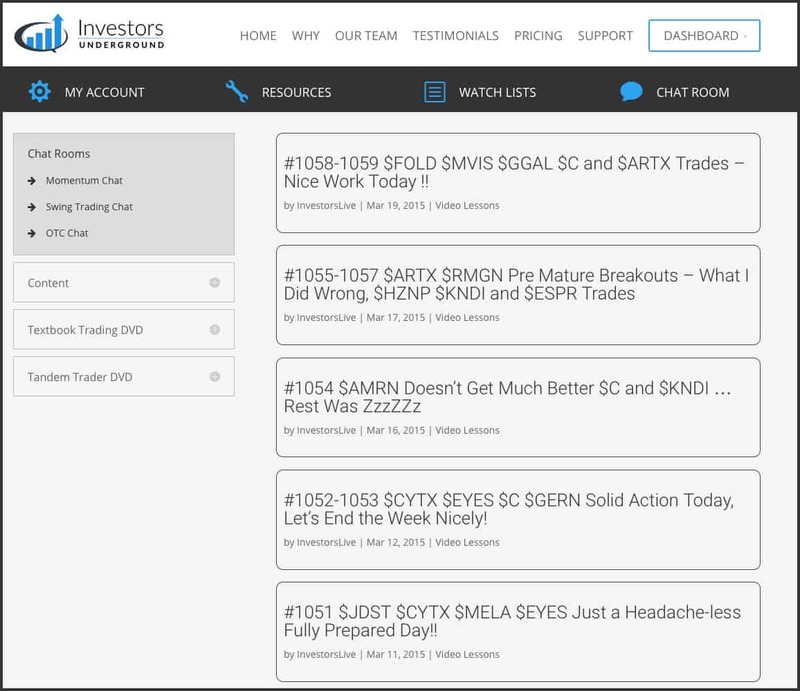 We create a game plan before the market opens and continue to post trade alerts throughout the day.We have 3 different chat room: Momentum Chat, Swing Trading Chat, and OTC Trading Chat. This allows traders with different trading styles to choose a room that aligns with their strategy. Unlike many other chat rooms, our room is noise free. We focus solely on providing quality alerts. If you have any questions throughout the day, you can reach out to one of our moderators via private message, and they will be happy to help you out. 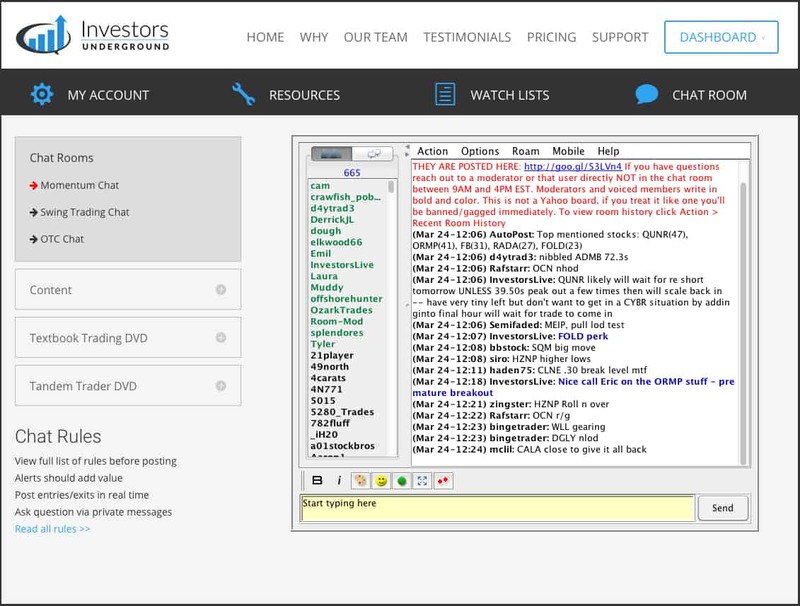 Our chat rooms are the best stock scanning tools you can find. We have veteran traders who have been profiting consistently for years. Imagine having the power of hundreds of great traders scanning the market all day and sharing the best opportunities. Trading is an ongoing learning process. Even the best traders can learn something new every day. Our goal is to help traders of all levels learn from each trade so that they can improve their trading strategy. Because of this, we provide a minimum of 2-3 video lessons every single week to our Elite members. In these video lessons, we go over the trades from the day and talk about what we did right/wrong. This allows new traders to understand exactly what we were doing and why. You get to see commentary about the trades and learn from the successes (and failures) of profitable traders. Learning how to become a profitable trader requires constant dedication and effort. That being said, the rewards of being a profitable trader are well worth the work required. Investors Underground provides traders with all of the tools they need to become successful in the markets. Feel free to take a free test drive of our service and see what we are all about. We can even hook you up with a special deal on bundles if you contact us via the support page. Enjoyed watching these free video lessons. Still reading and studying, hoping some day to be able to trade like you guys. Thanks! Everything about what you guys are doing is awesome and very much appreciated!